For 47 years, biologists have plucked eggs from seabird nests along the British Columbia coast. Many of the eggs were collected from remote rocky islands surrounded by some of the world’s roughest seas. In all, they collected 537 eggs from six species, including ancient murrelets, rhinoceros auklets and double-crested cormorants. Now these eggs are revealing new information about the way mercury finds its way into the ecosystem. The eggs of top predators, like these seabirds, are important for researchers who study chemical pollutants. We use these eggs to understand, for example, how mercury levels in seabirds have changed over time. This data helps us understand whether control measures, including international agreements, are reducing mercury levels in the global environment. Human activities, especially the burning of coal, release mercury into the atmosphere. Mercury levels in the Pacific Ocean are now three to five times higher than they were before the industrial revolution. Our activities have released 1.5 million tonnes of mercury into the air, land and water bodies since 1850. For wildlife —and humans — mercury is a neurotoxin. High levels in the food chain can have negative impacts on the reproductive health of seabirds, marine mammals and other carnivores that feed on seafood. For example, seabirds with heavy mercury loads are less likely to breed. Mercury also slows down the healthy growth of chicks. Researchers had thought that the seabirds that feed on large predatory fish would have the highest levels of mercury because large fish, which are higher up the food chain, accumulate more mercury in their bodies than the small fish and invertebrates that occupy the bottom of the food chain. But later studies contradicted these expectations. By studying mercury levels in the eggs of seabirds over many years, researchers found seabirds that fed on invertebrates and small fish had higher mercury levels than the seabirds that ate large fish. Our research explained why the highest mercury levels occurred in species that ate small fish. We measured mercury levels and a collection of dietary tracers called stable isotopes in the seabird eggs. We studied nitrogen, carbon and sulphur isotopes because these chemicals tell us about the type of food the birds were eating. We found that the seabird eggs with high mercury levels also had higher sulphate levels. It meant that these birds were eating small fish from areas that were also favoured by a specific type of bacteria. These bacteria, called sulphate-reducing bacteria, convert mercury to methylmercury, the toxic form of mercury that can move up the food web and harm seabirds. These bacteria tend to be found in deep-water sediments. The study also showed that mercury concentrations in Pacific seabird eggs have been relatively stable over the past 50 years. This is surprising, given the dramatic changes in mercury concentrations in Pacific waters. A decline in surface-dwelling fish stocks in the Pacific Ocean has forced some seabirds to feed elsewhere where there are fewer sulphate-reducing bacteria. By changing their diet, these seabirds end up with lower mercury levels. Monitoring programs have suggested that environmental levels of mercury are in decline, but this research suggests otherwise. Based on our results, we believe monitoring programs need to consider the structure of the food web, including where these birds are foraging. Although this research focuses on the eggs of seabirds, it has implications for human health. The World Health Organisation has identified mercury as one of the top ten chemicals of major health concern. Mercury pollution is a global issue since elemental mercury travels over long distance and methylmercury accumulates in the food chain, posing a serious risk to both humans and wildlife who feed on seafood. The global scale of this issue was the key driving force for a global environmental treaty called the Minamata Convention, which enforces reductions on mercury emissions. The agreement entered into force on Aug. 16, 2017, making it the most recent international law that aims to protect humans and the environment from the threat of toxic mercury. 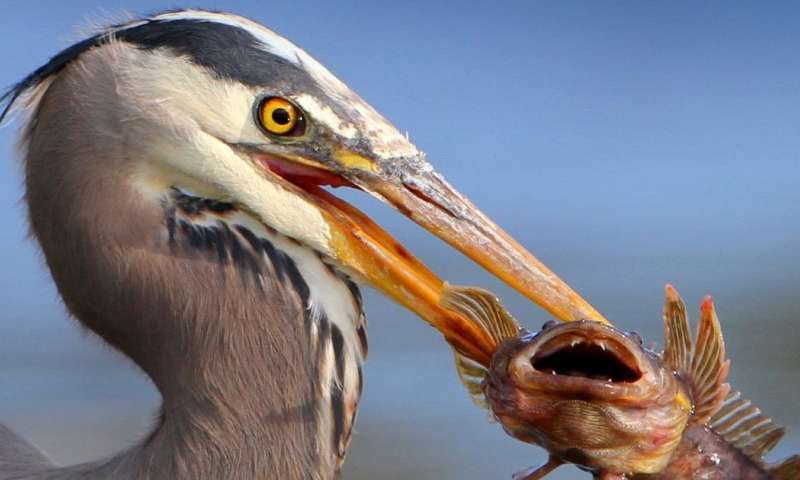 The current study on avian predators, which feed on marine food webs similar to those we feed on ourselves, illustrates how important it is to consider those food webs when considering the risk of mercury. Rather than simply considering larger species high in the food chain as being riskiest, we suggest that governments also consider the role of bacteria and reduce the consumption of those fish feeding in food webs with high levels of sulphate-reducing bacteria. This entry was posted in 2017, International and tagged pollution, study on 26 Nov, 2017 by Birdlife20 owner. Songbirds, being skilled vocal learners18,19,20,21, provide an opportunity for studying how errors are assigned and minimized during the learning of complex motor sequences. A young zebra finch (Taeniopygia guttata) imitating an adult tutor has to match a series of spectrally distinct sounds (syllables) performed in a precise order (Fig. 1b). Zebra finches are capable of adjusting their developing song towards its target in a variety of ways, including morphing the spectral (phonological) structure of song syllables22,23,24,25, generating and adding novel syllables to their song23, 25, 26, and rearranging the positions of existing syllables26, 27. How then do they cope with the complexity of selecting the appropriate combination of operations that would reduce the mismatch between their own song and the target? This entry was posted in 2017, International and tagged bird vocalization on 11 Nov, 2017 by Birdlife20 owner. Devastating and deadly wildfires in California’s wine country this week made it clear that this summer’s brutal fire season in the West isn’t over yet. Nationwide, 38 fires are still burning, 17 of them large and uncontained, according to a daily report from the National Interagency Fire Center. Fires have scorched more than 8.5 million acres in 2017 so far, compared to a 10-year average of about 6 million acres. Multiple firefighters and citizens have died in blazes this season, and thousands of homes and businesses have been destroyed. Smoke has made the air dangerous to breathe in many parts of the West. Like melting glaciers and rising seas, larger fires and longer fire seasons are among the predicted effects of climate change that are now coming to pass. With that in mind, it’s worth exploring how wildfires affect birds. It’s hard to definitively say how avian communities will be affected in the long term, but generally speaking—for now, anyway—wildfires don’t pose a major threat for most birds. What do birds do when wildfires break out? No surprise here: They fly away. A fire might kill weak birds or, depending on the time of year, claim nestlings. But at least in the Western forests that U.S. Forest Service research biologist Vicki Saab studies, birds evolved alongside fire and flee in the face of conflagrations. “Direct mortality is not a big concern,” Saab says. How do wildfires physically affect birds? Assuming birds escape a fire, smoke might still affect their health in ways that aren’t very well understood. “We do know that exposure to particulate matter, which of course is of great concern for human health, can affect birds as well,” says Olivia Sanderfoot, a National Science Foundation Graduate Research Fellow at the University of Washington Seattle who studies how air pollution affects birds. For example, veterinarians and poultry scientists who study captive birds have found that smoke can damage lung tissue and leave the animals susceptible to potentially lethal respiratory infections. How that plays out in the wild is largely unknown, Sanderfoot says. Her current research aims to track changes in bird populations and diversity after exposure to smoke from large wildfires. In some cases, smoke inhalation might make it harder for birds to flee onrushing flames. Thick smoke, for instance, may have contributed to the deaths of 50 adult White Ibises during a 1999 fire in the Everglades, Sanderfoot reported in a recent paper. And some low-flying species might succumb to smoke inhalation or exhaustion before they can escape forest fires, according to the Alberta Institute for Wildlife Conservation. For a Black-backed Woodpecker, for example, a newly burned forest provides a smorgasbord. Bark- and wood-boring beetles arrive in droves and lay eggs in charred trees; woodpeckers feast when they reach the larval stage. There’s often an influx of other bugs, too, which draws aerial insectivores like Dusky Flycatchers and Mountain Bluebirds that hunt for midair meals in the new forest openings created by fire, Saab says. The patchwork of post-fire habitats also suits White-headed Woodpeckers and other species that nest in open areas but forage in unburned surrounding forests. Other birds benefit from fires over the longer term. Kirtland’s Warbler, for instance, nests only in the fire-dependent jack pine forests of Michigan, Wisconsin, and Ontario. Jack pine cones are sealed tight with resin until fire opens them up, releasing the seeds and generating new warbler habitat. Red-headed Woodpeckers, which nest in the high limbs of dead trees, can see a local population boom after a fire devastates a patch of forest. Blazes aren’t a boon for all avian species. Wildfire forces those that dwell in old-growth forests—including Pileated Woodpeckers, Townsend’s Warblers, and Golden-crowned Kinglets—to go in search of new places to nest and forage. It also poses a serious risk to a bird that faces plenty of other threats: the Greater Sage-Grouse. Fire in the sagebrush ecosystem—upon which this iconic species depends—often gives invasive plants such as cheatgrass and juniper a leg up on slower-growing sage, and they provide fuel for future fires. Do birds ever start wildfires? When combined with electricity, yes. We’ve all seen birds perched harmlessly on power lines. But if they manage to touch two transmission lines at once, they form a circuit and get zapped. In two recent fires started by birds, hawks were carrying snakes. Chances are, those writhing meals-to-be touched the second power line, electrocuting dinner and diner both, and sparking the blaze below. There are credible claims that birds intentionally spread fires, too. Audubon and other publications have covered anecdotal reports of northern Australia raptors picking up burning sticks and dropping them elsewhere on the arid landscape to flush out prey like lizards and snakes. Mark Bonta, the Penn State geographer behind those reports, says that he and colleagues have a forthcoming peer-reviewed paper with further evidence that Black Kites, Brown Falcons, and Whistling Kites all spread fires intentionally. The researchers haven’t yet captured video or photographic evidence of the phenomenon, but Bonta says they’ve confirmed it by interviewing local experts and reviewing publications of aboriginal knowledge. This entry was posted in 2017, International and tagged habitat, wildfire on 7 Nov, 2017 by Birdlife20 owner. After harvesting a corn or soybean crop, farmers may plant a cover crop for a variety of reasons — to reduce soil erosion and nutrient runoff, increase organic matter in the soil, and improve water quality. Now there’s another reason. University of Illinois research shows that migratory birds prefer to rest and refuel in fields with cover crops. “Here in the Midwest, we’re in one of the major flyway zones for migratory birds, where there once was plenty of habitat for grassland birds to safely forage and rest during their migration. Now that agriculture is the dominant landscape, they’re finding it harder to get the resources they need on the way to their breeding grounds,” says Cassandra Wilcoxen, a graduate research assistant in the Department of Natural Resources and Environmental Sciences in the College of Agricultural, Consumer and Environmental Sciences at U of I. “We think cover crops, such as cereal rye, likely provide migrating birds with more vegetation and a safe area to escape from the elements and from predators,” Wilcoxen says. “Cover crops also increase insect abundance, another food source for birds. The increased number of insects allows migrants to fuel up faster and move on to their breeding grounds. Fields with cover crops are not going to replace natural habitats, but in early spring there can be miles of fields with little vegetation. The advent of cover crops provides a potentially important habitat for birds returning to the Midwest from areas as far south as Argentina. The large green fields are likely a beacon for migratory birds. Over two planting seasons, Wilcoxen monitored birds in corn and soybean fields with and without cover crops. She observed 6,133 individual birds of 52 species, with 13 species accounting for 90 percent of all birds detected. The most common species were the red-winged blackbird, common grackle, and American robin. “Fields with cover crops always had more birds, and corn fields with a cover crop were the overall winners,” Wilcoxen says. She thinks corn plus a cover crop, especially cereal rye, was the favorite because there is more residue on the fields; the remaining corn stalks along with rye provide more cover for the birds. What’s the downside? Wilcoxen says it’s all in the timing. “The window of time to plant a cover crop in the fall is fairly short. Cover crops can be aerial seeded, drilled, or broadcast. But depending on how wet the fall is, there is only a short time when it can be planted. Drilling is the best method because you know you’re getting good seed-to-soil contact,” she says. Another timing issue emerges in the spring: when to kill the cover crop. “In our experience, most farmers using cover crops have learned about the practice from their neighbors, and we are hoping this continues and cover crop use continues to grow,” Wilcoxen says. Will what’s best for migratory birds motivate farmers to plant cover crops and terminate them a bit later to allow birds to use them for habitat? Wilcoxen is hopeful. She says one of the aspects of her work that she enjoys most is bringing together the agricultural community and the wildlife community to work together for long-term environmental health. This entry was posted in 2017, International and tagged foraging, nesting, resting on 5 Nov, 2017 by Birdlife20 owner. University of Delaware doctoral student Desiree Narango is researching trees and shrubs planted in the lawns of homeowners throughout the Washington, D.C., Maryland and northern Virginia areas to assess how those choices are impacting food webs. Narango, who is working with Doug Tallamy, professor of entomology in UD’s Department of Entomology and Wildlife Ecology, is also associated with the Smithsonian Migratory Bird Center and works through a citizen-science program called “Neighborhood Nest Watch.” Narango is co-advised by Pete Marra, director of the Smithsonian Migratory Bird Center. Through her research, Narango looks at breeding birds and the food resources they need, such as insects and caterpillars. Different trees vary in how much food they provide birds, and Narango said she has a network of homeowners in the D.C. metropolitan area who allowed her to use their yards for her study. Over the course of the four-year study, Narango has looked at 203 yards. One thing that has stood out to her is the sheer number of different trees that are planted in these yards. “We focus on woody plants — so trees and shrubs — and we’ve documented over 375 different species in these 203 yards. Which is crazy,” said Narango who added that it became apparent quickly that some trees are better than others with regard to sustaining food webs. Narango added that there are a lot of non-native plants — such as zelkova, ginkgo and lilac — that don’t provide any resources for breeding birds. Narango said that a problem homeowners may face when trying to select native versions of plants is that a lot of the big box stores don’t carry them. As for the most eye-opening aspect of her research, Narango said that it has to be the tremendous amount of diversity in bugs and birds in people’s backyards. “A lot of people think you need to go to the woods to see beautiful butterflies or beautiful birds, but they’re actually in people’s backyards, too,” said Narango. In the group’s bird surveys, they documented 98 different bird species. Narango focuses on the Carolina chickadee and said that she would follow individual birds around to see what trees they were choosing. One of the major findings in her paper is that the number of caterpillar species a plant supports predicts how strongly chickadees prefer it. “When these birds would choose a tree, all the other birds in the neighborhood were choosing those trees, too. So we would see these amazing warblers that don’t breed in Delaware or in D.C. but are migrating through, and they’re using all these suburban habitats on their way north. In a way, our chickadees were telling us what all of the birds want during that period,” said Narango. As a landscaper herself, Narango added that it was surprising to see how much life happened in her own backyard when she started planting the right species. “I planted this flower called ironweed, and the first year it was there, I had the specialist bees that use that flower and then I have caterpillars in my shrubs, and it’s really cool how quickly you can see life be attracted to your yard when you plant the right species,” she said. This entry was posted in 2017, International and tagged breeding, habitat on 5 Nov, 2017 by Birdlife20 owner. Birds use vocalizations to attract mates, defend territories, and recognize fellow members of their species. But while we know a lot about how variations in vocalizations play out between populations of songbirds, it’s far less clear how this variation affects birds such as penguins in which calls are inherited. A new study from The Auk: Ornithological Advances examines differences in the calls of Little Penguins from four colonies in Australia—nocturnal birds for whom vocalizations are more important that visual signals—and finds that disparities in habitat, rather than geographic isolation or other factors, seem to be the key driver of variation in the sounds these birds use to communicate. Diane Colombelli-Négrel and Rachel Smale of Australia’s Flinders University recorded calls from four Little Penguin populations across a small area of South Australia, one of which had previously been shown to have subtle genetic differences from the other three, and used playback experiments to test penguins’ ability to distinguish between calls from different colonies. They found that agonistic calls, which are used in pair displays and aggressive situations, varied among the four populations, and that the calls’ characteristics appeared to depend on small-scale differences in the habitat where the penguins lived. However, birds did not discriminate between calls originating from different colonies, which suggests that agonistic calls don’t seem to play a role in isolating the two different genetic groups. This entry was posted in 2017, International and tagged bird vocalization, penguins on 5 Nov, 2017 by Birdlife20 owner.